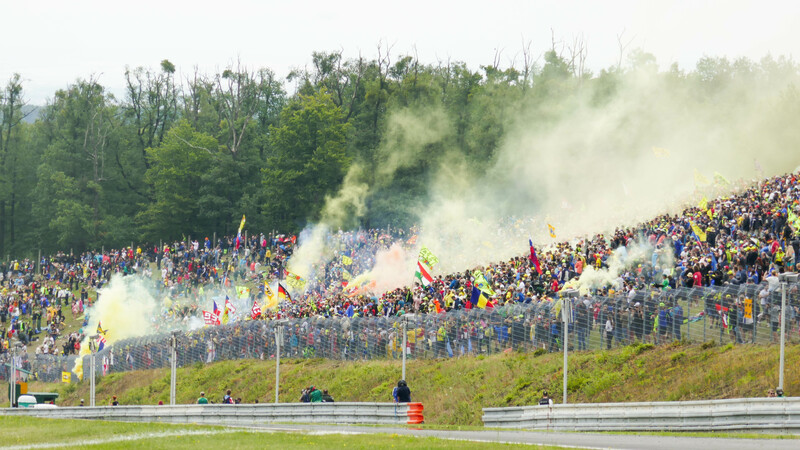 Brno is a viewers paradise, with good access & vantage points. Generally the grandstands are in two areas: the main straight and the 'Stadium', the iconic downhill double chicane. We are Brno's largest agent and have all tickets. Our suggestions: for pole position, get T5; then T2. The only covered stand and right on the grid is T3 (smallest as well, always sells out first). Best value seats are T4 at the lower end of the stadium and T1 overlooking the stadium. Best viewing overall is the 'C' standing area with the "Gold" general admission ticket, but this gets very crowded - Discounted general admission tickets available for package customers only. All tickets are valid 3 days, and all grandstands are reserved seating and permit access to general admission areas. All Grandstand, hospitality and "Gold" general admission permit tunnel access between paddock and T3. Great TV views from all tribunes, as well as many standing areas. See also our hospitality club if you want 'better than grandstand'. All tickets will be electronic, A4 printable tickets in PDF format sent via email around 4 weeks before the race weekend. Reserved seat. Great view from infield of back corners at top of 'Stadium'. TV screen. Most recommended. Reserved seat. Near start grid, TV view; across from pits. Reserved seat. Only covered stand, on start grid; directly across from podium. TV view; underpass access. Very sought-after. Reserved seat. . Very wide, elevated view at back of track, TV, concessions exclusive to grandstand. Reserved seat. Right on start line at pole position, TV view; view to podium. Reserved seat. Stand at entrance to 'Stadium' on turn 6. TV view. General admission access to most areas in and out field (B/C/D/E/F/G). Includes access to the tunnel. General admission access to most areas out field (B/D/E/G). No access to the tunnel.